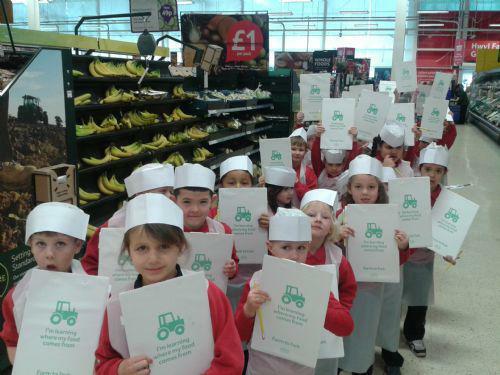 Monday 24th March saw Year 1 go to Tesco for an Educational Visit. As we arrived we put our aprons and hats on to protect all the food from our germs. We then were given our clipboards and given tasks to do. We tried to find and name all the fish on our list at the fish counter. We then sampled three cheeses and were asked to decide which one was our favourite. The most popular cheese was Cheddar. We then went to see how the many different types of bread are packaged. We also went to the produce section and were given a task to find all the colours of the rainbow. Finding blue and purple was a challenge, but we managed to find some items in the end. We were told that Tesco's most sold item nationwide was the banana which we thought was very interesting. To finish off our visit we went backstage again and sampled many different types of fruit, some of which were brand new to us and are going to be put on our shopping lists on our next visit. The children's behaviour was excellent throughout and they are a credit to our lovely school. Da iawn blwyddyn un!